As you may have guessed this is a dark company with very low liquidity. 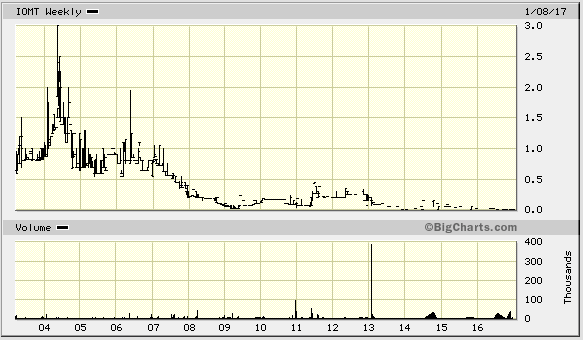 Possibly the lowest of all my stocks so good luck getting shares at this price. Isomet is a real company and they even publish annual reports on their website. More on that below but first we have to talk about this price. But it's not really as rosy as that. The reports are not audited to save money. $2.5M of their assets are inventory. They have about $1.4M in debt which has been in default for years, so there's an additional $0.5M in accrued interest payments. The notes are accruing unpaid interest at 8%. $1.1M of the $1.4M in notes payable are convertible into common at a price of $1.60 per share, I'm not sure the exact number of shares it would be. 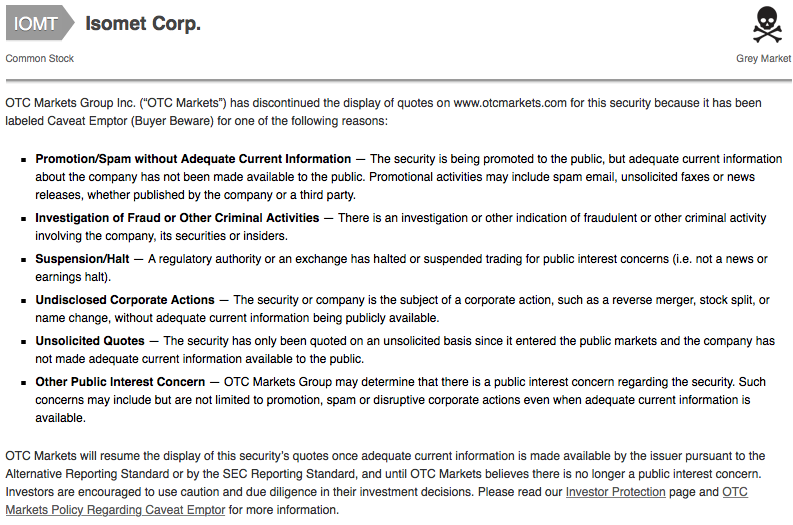 OTCM is cautious with Isomet because of the SEC. 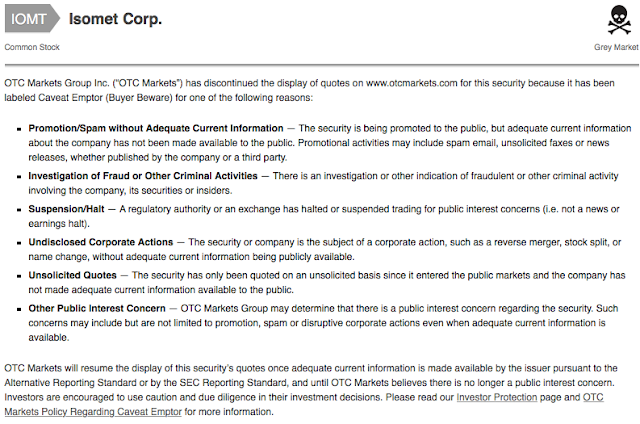 In 2013 the SEC suspended trading for IOMT and the issue has never been resolved. I asked management about this and they said it was some misunderstanding. I don't remember the details. They submitted some paperwork to resolve the issue but in the end it was going to cost them money to go through the proper legal channels so they dropped it. Maybe that's why we can now buy the whole company for half the price of a Big Mac. The company makes laser equipment, systems, and accessories. Most of their business is done in Asia with the rest primarily being university research labs. They have a UK subsidiary, which incidentally is audited by law, doing about 1/3 of their revenue. I don't have much of an opinion on the business other than it sounds impressive and I don't think there's a whole lot of growth for the current product. The 2015 report contains a shareholder letter discussing some R&D on new products, among other things. They are certainly trying to expand and survive. I had a call with management in July 2016. Their goal is to stay alive until one of two things happens: profits come back or they get bought out. Unfortunately they're in a hyper-niche business with only a few others in the space so not a lot of options on the buyout. They told me of three other competitors: Gooch & Housego in the UK, ANA in France, and Intra Action in Chicago. In 2008 Gooch did DD on buying out IOMT but backed away. Maybe they'll come back. Not sure what to say on the value of this stock. To me this stock will end up being a bargain as long as the company stays in business. I mean the stock costs nothing so if they're still around in 5 years it must go up. BV is $0.71 per share but that may not mean much depending on your opinion of their inventory. Revenue is $2 per share. The notes convert at $1.60 per share. A positive note is the long term chart. The stock is in a long term low range and was up trading around $0.75 a decade ago. I don't know what a private party would pay. If it's worth 1x revenue that'd be $2M for the equity = $1 per share = 100 million percent increase over the latest share price. HA! Are you sure your number of shares is right? Are there no dilutive instruments outstanding? I've looked at this some time ago and I don't trust the reported financials. 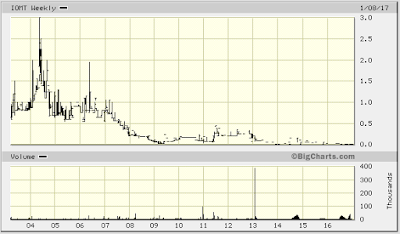 I've looked up the financials of their wholly owned UK subsidiary Isomet (UK) Limited. On Dec. 31, 2015 their accounts showed Debtors of £863k as a current asset. The annual report for Isomet Corporation for the same date shows Accounts Receivable of $272k. How can that amount be so much lower when the operations of the UK sub should be consolidated? I don't really believe in contacting a company in a situation like this. I just don't see how I can trust anything they say to me. Their financials are unaudited. They've been suspended by the SEC. I don't think that happens by accident. Perhaps someone else who's looked at this company can explain why the amounts differ so much. Could it be because the UK sub's financials include intercompany receivables that have been eliminated in the financials of the parent company? How can we verify this though without relying on a statement by management? At the end of the day, I think it just comes down to whether you trust what they say. Thank you for the different viewpoint from my own. How did you get a quote on it? Did you just ask your broker? I never got a quote, I just put in a limit order at a price I thought made sense. Then I waited. Dan, how much volume of this trades per day? I'd just buy the whole company out for $3. How did you find this in the first instance. You made me laugh with "Maybe that's why we can now buy the whole company for half the price of a Big Mac. " There's no volume. It traded on only 13 days in 2016. I can't stop chuckling about Isomet's market cap. It's just too much. I know for a fact my broker, won't let me buy this. I want some. But who owns the $1.4M in debt? It's accruing 8% interest right...When is the debt due? Is it tradable? Also you wrote "$1.1M of the $1.4M in notes payable are convertible into common at a price of $1.60 per share, I'm not sure the exact number of shares it would be." - Don't we just have to divide $1.1M by $1.6? = 687500 shares issued. I don't know who owns the debt but you could ask the company if you want. I don't think it's trade-able. It must be insiders since it's been in default for years and they keep pushing out the interest. The debt consists of 3 groups of notes due 2009, 2011, 2015. I don't think you can just assume the conversion math to be total debt / conversion price. But I don't know. For anyone to exercise that conversion the stock would have to be above $1.60 anyhow so it's not really a concern right now. I don't understand, how does one trade a company's stock when the market cap is only like $2 lol? Is someone actually selling out all the way down here? How is there even liquidity lol? How does this company even exist at this ridiculous price? Do you technically own the company now or do insiders hold the most? This is all so confusing yet fascinating lol. hahaha. Glad you see the humor in this one. This stock trades like any other and it is real. The volume is extremely low so there is not much liquidity. Over the past year the stock has only traded 14 times, for prices between $0.02 and $0.000001. The price is super low just because no one knows about it, there's no liquidity, they have too much debt, and there's the SEC issue. My guess is the recent trade of 14k shares at $0.000001 came about because someone who had held shares forever died and their account was liquidated at whatever price could be had. If you want shares in IOMT you can buy them. You will just have to wait because it rarely trades. Put in a limit order for whatever price you feel is appropriate then sit back and do nothing. You may or may not ever get filled. The price, which is now 5 cents, is of course a bit of an illusion as not all holders of this stock would sell for 5 cents. However, it is still a bargain. Which brokers support the grey market? (IB does not). Of course you could say that about any stock. But yes for sure IOMT with market cap of $2 is an especially crazy situation. I have accounts with Schwab, Etrade, Penn Trade, and Fidelity. Schwab, Etrade, and Penn Trade all allow grey market trading.